This allows you to open up a view directory so users can see what files they have. This allows you to have images in your programs. This is usually used when you have multiple choices for your users. This allows your users to type text in programs. This allows your users to save what they have done. This is a lesser version of the rich text box. This can be used to make events happen at a certain time. This allows your users to make something happen. So you can give your users an idea of what something does. I will be talking about the ones highlighted in red from left to right. So first off we have the new project tool this is basically a short-cut to save you from going to File>New project. Next is the open file tool again this is just a short-cut to save you going File.Open file. After that we have the add new item short-cut by now im sure you get the gist, an item is like a Form or a Module or User control ect. Next we have save and save all they basically do what they say on the tin. Next are your Cut,Copy,Paste options which are in most programs now days so you should know how to use them. Then is the Find tool this allows you to find anything within the visual basic software or the software you are developing. The next two are to comment and uncomment lines in your work. Undo and Redo are next on the list again they do as they say on the tin, and next to them is the tool to allow you to go back a Form and go forward a Form. The green play button debugs and runs the program you have made this is so you can have a feel of what your users will be using and see if there are any bugs/glitches in it, the button next to that pauses the debugging process and the one next to that stops the debugging process. The next button allows you to step into a component of your software and the one next to that allows you to skip over a component, and the final one after that allows you to step out of a component. 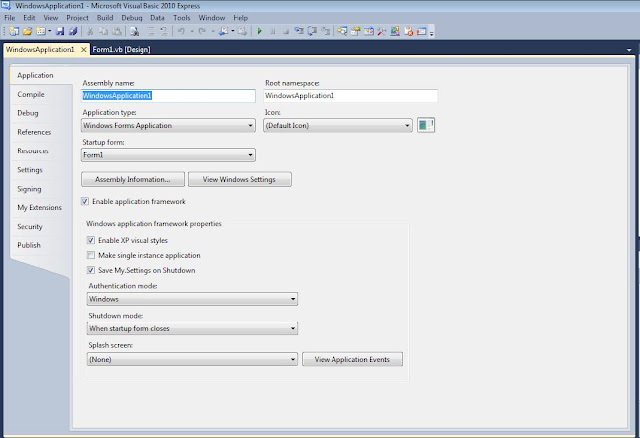 Solution explorer is next and this shows you all of the components you have in your program. Then its the properties window we used this in the last tutorial to change the text of the button. Next is the object browser this shows you what Microsoft does to make your program. The next thing is the toolbox short-cut it will open the toolbox for you. the next three you wont necessarily need so i will leave them for now. This shows you all of your program properties the Application tab shows you the name, allows you to add an icon to program, decide what form will show up first, change what version number it is. The only other ones you will need to know about is the settings and publish. Settings allows you to make things like a user system and tab system but we will go into more depth on those soon and the publish tab allows you to publish your app and once you've done that it will make an installer for your program if you want your customers to install your program. 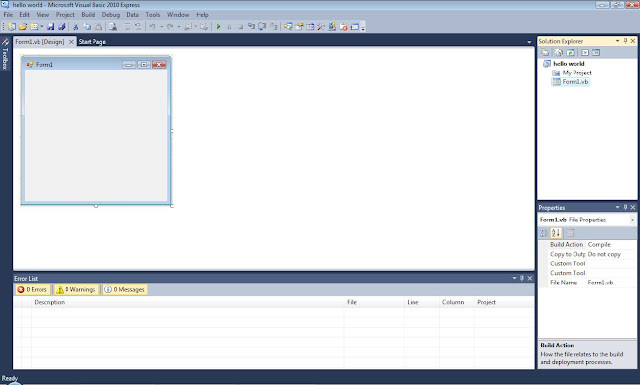 Now all you need to do is combine what you have learnt this tutorial with what you learnt last tutorial and you will be a wizz at visual basic thankyou for reading this and if you had any issues you can email me, stay tuned for more visual basic tutorials.